How do I schedule multiple employees at once? If you have multiple shifts starting and ending at the same time for one position, you can add multiple employees when creating a shift instead of creating a shift for each one of them individually. 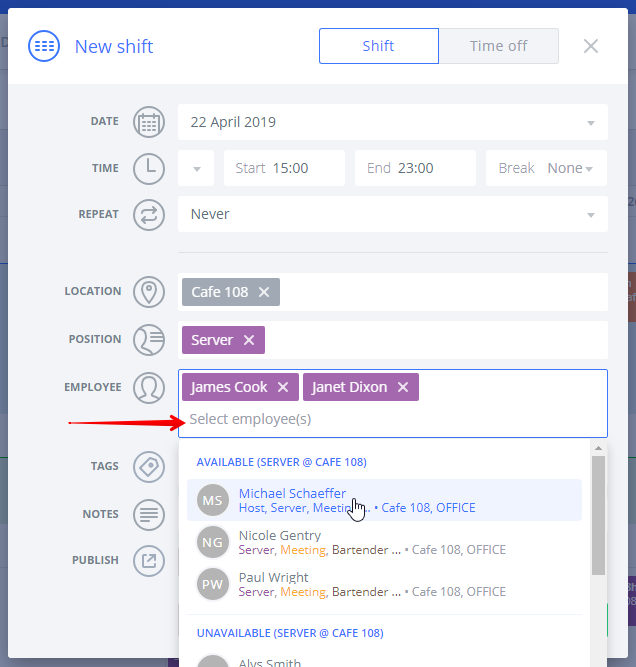 Please note, if you try to use this function to schedule employees for different positions, the shifts will all be created for whichever position was designated in the new shift window rather than the position an employee is assigned to. To add more than one person to a shift, continue clicking in the employee field and choosing names from the list until you have selected as many as you need. You can also type names or hold down the ENTER key to add everyone easily. When you save the shift, it will create a separate but identical shift for each of the employees you selected.